If you ever have the opportunity to band birds, by all means participate. I had the extraordinary experience of being involved in a bird banding project in the Big Thicket National Preserve. The project was part of a nationwide bird-monitoring program known as MAPS (Monitoring Avian Productivity and Survivorship). 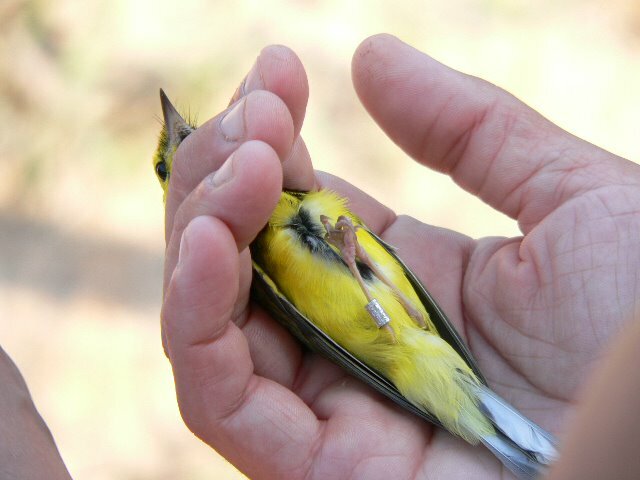 Through mist netting and banding birds during the breeding season it helps monitor shifts in bird populations that are impacted by factors such as climate change and loss of habitat. I have always wanted to do this not only to see how it is done, but to also be able to hold a live bird in my hands and see it really up close. We arrived at 5:00 a.m. and began setting up a series of 10 mist nets in a loop pattern around 6:00 a.m. The nets are made up of a black, fine mesh that is practically invisible to the birds as it blends into the forested background. Every hour we would walk the loop and check the nets for birds. Birds captured are delicately removed from the netting and then placed into a soft protective bag and then carried to the data collection station where they are identified, aged, sexed, weighed, and general condition noted. It is then banded with an aluminum numbered band (unless it was previously banded), and then released back into the wild. If your interested check with your local Audubon Society to see if they know of anyone needing volunteers to help with banding projects. It's an experience you'll never forget.